I have been counting the days since summer “break” began, watching them tick down along with my sanity. Summer has such utopian appeal: the warm sun, lazy days by the water, sleeping in, and freedom. At least, it used to have appeal … before I became a stay-at-home mom. The reality is that Summer Break damn near kills me every year – EVERY YEAR! When will I learn?! – and I always forget just how brutal it is, until I find myself in it again 365 days later. The answer for me is yes. Yes, I can technically survive 12 weeks at home with my children underfoot, but I’m also fairly certain that it’s shaving years off my life. Here’s hoping that the benefits outweigh the drawbacks, because I seem to be aging at an alarming rate. Part of why I look so tired is because I AM. 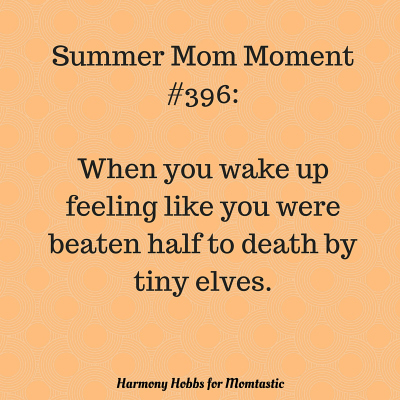 There’s “normal mom” tired, and then there is “summer mom tired.” Summer mom tired is borderline debilitating. At this point, coffee must be brought to my bedside just to get me to sit up. I used to be a morning person, but now, not so much. I look forward to the start of the school year and my slow return to the land of the living. But until then, don’t disturb my sleep. I’m not getting enough of it as it is. “GO OUTSIDE!! 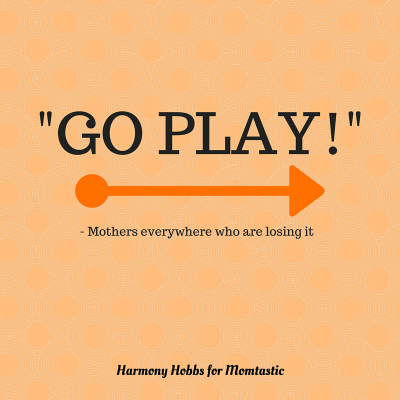 !” This is the anthem of mothers everywhere, who are desperate for a moment of peace. I waffle between hiding out indoors in the air conditioning and running outside to spray them down with the water hose, feeling very much like a harried zookeeper. I don’t really care what they’re doing out there, as long as there is no blood or broken bones. Currently, it looks like they’re building a fortress out of cinder blocks. Where did they get the cinder blocks? There’s no telling. 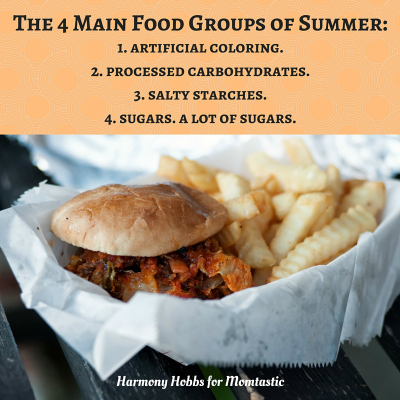 During the summer when I don’t have all my wits about me, all prior food standards are tossed out the window. I start out solid, with lots of fresh fruits, whole grains, and lean proteins, because I know how to mom right, I swear I do. The thing is, the cares slowly get beat out of me, day by day, until I simply stop giving a flying flip WHAT they’re eating as long as they are eating SOMETHING. Doritos, Cheez Balls, Popsicles, Pop-Tarts, french fries, and chocolate milk are all totally acceptable breakfasts. It’s called survival, friends, and I am well acquainted with it. For the record, none of the displays of nakedness were intentional. 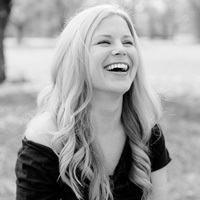 I just have too many kids, and my husband forgets that people can totally see into our house at night, and there was that one time I raced into the laundry room unclothed and a neighbor was at my back door. I don’t know, man — things just happen. But I figure if someone can’t handle a little nakedness, being around a bunch of little kids probably isn’t a good idea anyway, so it’s all for the best. I still wave, even if they aren’t making eye contact. I mean, how else am I supposed to function? 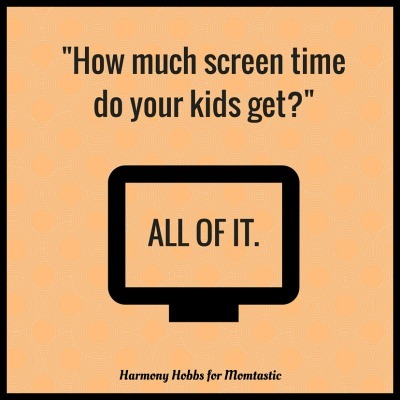 Until I discover the answer, I have acquiesced to unlimited screen time for the next 27 days until school starts. Because yes, I really am counting down the days, just as I stated earlier, because how else am I supposed to function?